This jacket has officially become my blankey, it goes wherever I go. And even when I'm not wearing it, I'm carrying it around so that we can be close. Issues. I'm totally into the layering necklace biz. What's better than one necklace? Two necklaces. Simple math. that blouse is gorgeous and i love this location! I want a close up of the necklaces!! That square one looks so fantastically cool. Such a unique pairing of pastel blue and fur - you're so good at mixing unexpected items in ultimately awesome ways. Stunning, the coat and shirt are amazing. Thanks dear I'm following you on bloglovin ! that blouse is a beauty! i adore that top! and the coat looks so cozyy!! I absolutely love the top you're wearing.. I wish I could get my hands on something similiar.. 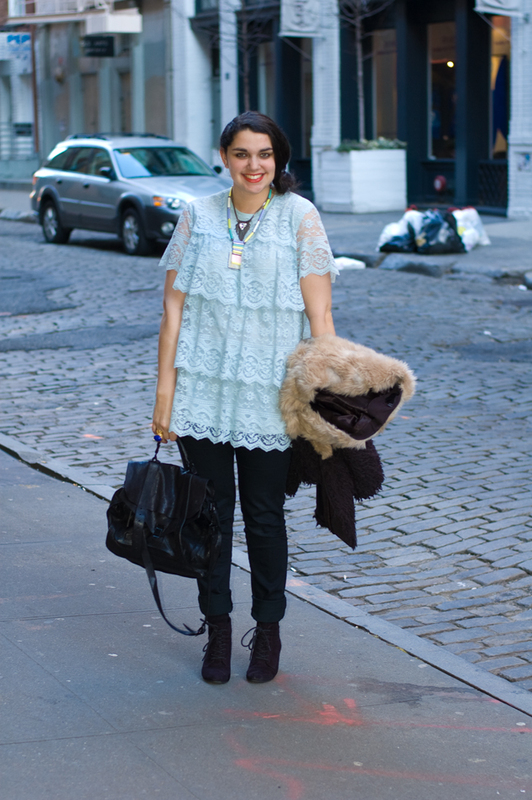 Such a pretty tiered top, I love the feminine lace. Looks great with the darker pieces like your pants and bag.